I’ve been orienteering for about 12 years and like many people I got into the sport through my family. My son Nick is now with PAPO and was previously a WOC member. Steph and I are with WOC. 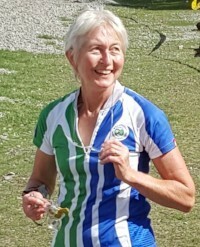 I have been the secretary at the Wellington Orienteering Club for 7 years and on the NZOF and then ONZ council for 6 years. My previous board experiences are BOT chair at Otari School and the Wellington Community Childcare Association. My predecessor, David Turner, and prior to David, Simon Addison, have been instrumental in turning NZOF/ONZ into a body able to give direction and vision for map sports in New Zealand. ONZ now also has a structure better able to support clubs and orienteers from beginners to elites. My vision for ONZ is to build on the foundations we have and ensure we are making the best use of our resources to provide that support to clubs and orienteers. I would like to see more engagement from clubs and members with ONZ and I will be working with Council to achieve this. I’d like to thank our outgoing Council members, Alistair Metherell and Tommy Hayes, and in particular David Turner, for their time and skill in shaping ONZ for the future. I’d also like to welcome our new Council members, Lynn McBain, Jenni Adams and Magnus Bengtsson onto the Council and look forward to working with them and Tom Davies. I welcome your comments and ideas, via email is the best way to contact me. You will have realized from the item above that we have a new Chair (Jane Harding) and in her introductory article it is relatively easy to determine that I have stepped down from the Board of ONZ. So I thought it appropriate to explain my reasons for this somewhat unannounced departure. I’ve been planning a major overseas trip during 2018 for some time now which would have translated into me missing much of ONZ affairs over the rest of the year. Consequently, I decided to end my term early and not to stand for Council or Chair for 2018. Having held the position as Chair for the preceding two years and prior to that President and Vice President, it seemed an appropriate time to step down and get some new blood onto the Board. It is great to have three new Council members (Magnus, Lynn and Jenni) and ONZ’s new Chair, Jane Harding who will all bring new vigour to the table. Finding an appropriate Partner to financially support and take our sport forward. So all in all, we are well placed looking forward and it provides me with comfort to bow out at this point. I’m certain that we have the right people in the right job to take NZ orienteering to the next level. Finally a word of gratitude and acknowledgement for the contributions and support provided by ONZ’s General Manager (Catriona McBean), our ONZ part time staff, Committee Convenors and Members; Selectors and lastly you – the able and talented volunteers. The competitions will be in and around Riverland and the Adelaide Hills as part of the Australian Championships carnival which runs from 29 September to 7 October 2018. Position description available on the ONZ website. JAFA will include an international test-match between the New Zealand Pine-Stars and the Australian Bush Rangers. JAFA 2018 is also the trials for the NZSS team to contest the Southern Cross Challenge in September, the NZ Regional Schools Competition, the 2018 Auckland Champs, and the final round of the Elite Super Series. With the ONZ Championships done and dusted for another year, April has been another relatively quiet month at home, the main feature being the South Island Championships hosted by Dunedin. This has been followed by both North island and South Island Secondary Schools Championships where some of the JWOC team, and those still contending for the remaining places have been competing. Overseas things have been winding up towards the European Championships and first round of the World Cup at the beginning of May, with several Kiwis in action at Tio Mila in Sweden, including Tim Robertson featuring in the Kovee team from Finland which finished third. In the immediate future we have the second JWOC Trials next weekend in Canterbury in association with the Ultra-Long being planned by Nick Hann. On Sunday evening Tim and Laura Robertson, along with Tommy Smith, will be lining up in the first race of the European Championships (World Cup Round 1) in Switzerland. Of course we also look forward to the Queen’s Birthday JAFA event which will include the schools trials for the Southern Cross Challenge, the final round of the 2018 SuperSeries, the Auckland Championships for 2018, and the home leg of the New Zealand Pinestars – Australian Bushrangers Test Match. The team for this should be announced shortly and should consist of 4 men and 6 women in the elite grades, with 6 men and 4 women in M20 and W20 respectively. Entries close at midnight on 11 May. We are into the final throws of instituting our own National ONZ SMP! Our Auditor has given us the big tick and I can now make it available to all. Before making it accessible I need to refine some of the documentation so it is user friendly and easily accessible online – I will notify clubs when this is done. We need to have a consistent/standard system that our club members, and in particular, controllers can use and relieve the pressure on clubs by having templates they can easily use. 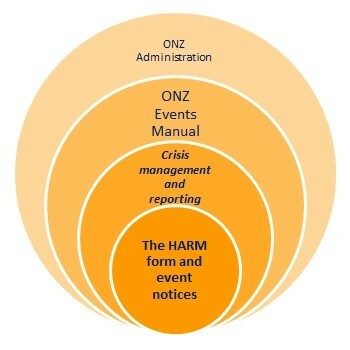 Before your eyes glaze over, I invite to you take a quick look at the core of the plan the; ONZ Hazard and Risk Management (HARM) form – a simple one page form to fill in for each event, then a list of generic hazards (to which you can add for ones not listed), how they are dealt with, and what to do if an incident happens. There’s not much new in this world of paper, and this is no exception – I have drawn on current standard practices and focused on the prevention of serious harm. In conjunction with, and part of, the plan we are developing an Event Manual the go-to document for Safe/Standard Operating Procedures (SOPs), which is weighted to keeping everyone safe whilst still enjoying the essence of our sport. Surrounding the HARM form are all the higher level processes, practices, polices making up the big picture. I hope the diagram outlines the general idea. ONZ is changing the way we select areas for our premier National Champs. The rotation system we have used in the past has had its day, and we are looking for areas that are fit for purpose, not just a nearby club’s capability or capacity to map and organise it. ONZ will event manage the process, drawing from the best people available from around the country. Criteria: The areas offered need to fall in line with the object of the different formats on offer. Long distance: Physically tough terrain allowing for good route choice possibilities. At this time we are looking for Long and middle distance areas. A sprint area within reasonable driving distance will be a bonus. Who can suggest an area? Anyone. Who will judge areas suitability: ONZ General Manager, ONZ Event Liaison, ONZ Performance Leader and invited experts (eg prospective controller). To register an area, please follow this link to an online form. These rules are being review with the respective committees but ONZ is now providing notice to all members if they have any feedback, suggestions or comments on policies being reviewed, to please forward them to the General Manager by 1 June. We are looking for the following trophies which were not returned for the 2018 National Championships …. and perhaps have not been returned for a year or two prior to this. We really want to ensure all our National Champions get the chance to celebrate their successes and have the trophy in their possession for the year. If you are in possession of one of the following trophies from previous years, we would appreciate it if you could return to the Orienteering NZ General Manager ASAP so it can be sent to this year’s recipient. Before you return it, don’t forget to get your name engraved on it! The 2018 General Assembly will be held in Prague, Czech Republic on 6 October 2018. At the General Assembly in Italy in 2014, the IOF Statutes were changed and the term length for Council members was increased from 2 to 4 years. A rotation system was introduced at the same time which means that 5 Council members terms are ending in connection with the 2018 General Assembly, and elections will be held for these Council positions. Orienteering NZ will have a chance to nominate candidate for positions no later than 5 June 2018. If you are interested in being nominated by Orienteering NZ for an IOF Council position, please contact Catriona to discuss your interest. Email gm@orienteering.org.nz as soon as possible.